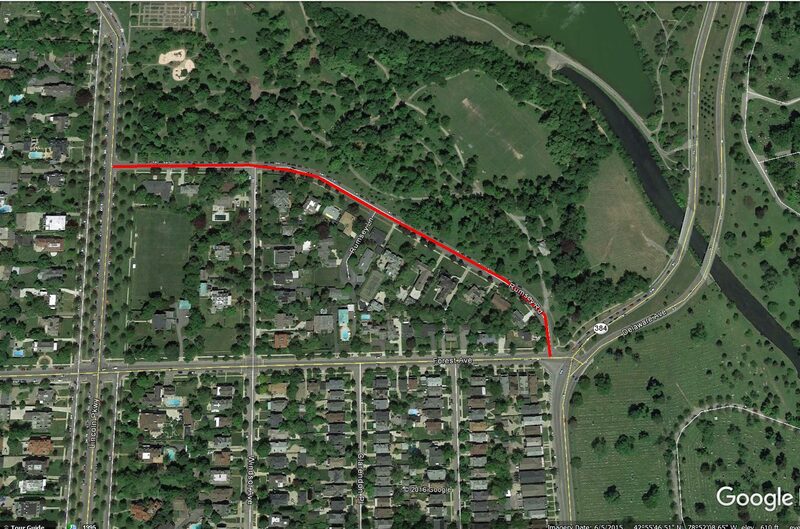 Rumsey Road is located along the southern edge of Delaware Park. The road is named after the Rumsey family, a prominent Buffalo family, one of the leading families during the early development and growth of Buffalo. 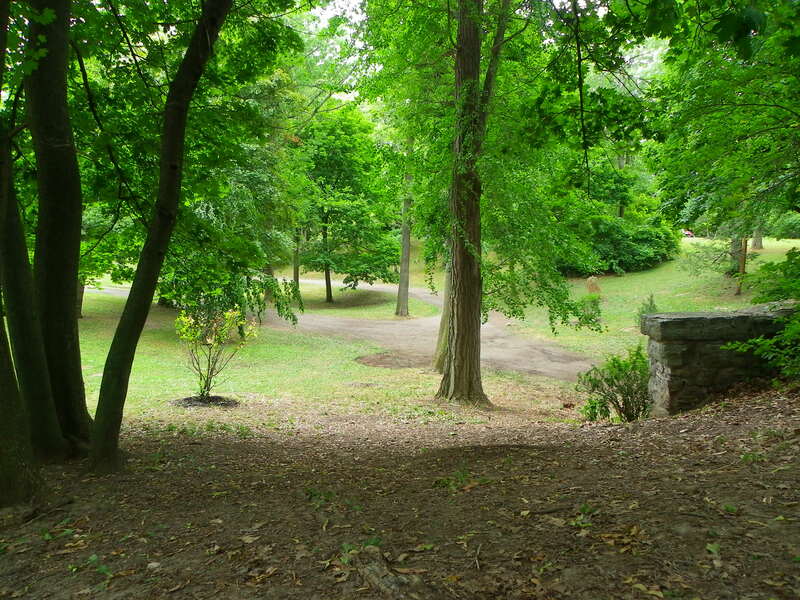 The portion of Delaware Park near there is called Rumsey Woods. The parents were Aaron and Sophia Rumsey. They had three children – Bronson, Dexter, and Eleanor. The family moved to Buffalo while the children were still young. Aaron Rumsey established a tannery located on the south side of the Main and Hamburg Streets canal, near Alabama Street. The sons joined the company as they grew to adulthood. Aaron Rumsey died in 1864, and the business was handed down to them. They turned A. Rumsey & Company into one of the leading leather firms in the United States. The business was eventually absorbed by the United States Leather Company in 1893. The brothers believed in the future of Buffalo, and showed it by investing much of their fortune into real estate in the City. It is said that at one point, they owned 22 of the 43 square miles that comprised Buffalo. Bronson Case Rumsey was born in Warsaw, Wyoming County, NY on August 1, 1823. Bronson was the first president of the Buffalo, New York & Philadelphia Railroad, a director of the Manufacturers’ and Traders’ Bank from its inception and a member of the Park Commission when it was first formed in 1869. Even after Bronson retired, he was still involved in financial, industrial and civic matters of the city. He remained on the Park Board until his death. He was a successful banker, merchant, and capitalist. Bronson married Eveline Hall. They had four children – Laurence Dana, Mary Lovering, Bronson II, and Evelyn. Bronson built Rumsey Park in 1865. Rumsey Park comprised the land bordered by Delaware Avenue and Carolina Street, Tupper and Tracy Streets. The land had been previously used as a lumber yard owned by Mr. Hodge. The Bronson C. Rumsey house at 330 Delaware Avenue was likely the first French Second Empire (mansard roof) house built in Buffalo. The house overlooked a spring-fed lake with a Swiss chalet boathouse, a Greek temple pavilion, terraced gardens, fountains and wooded paths. 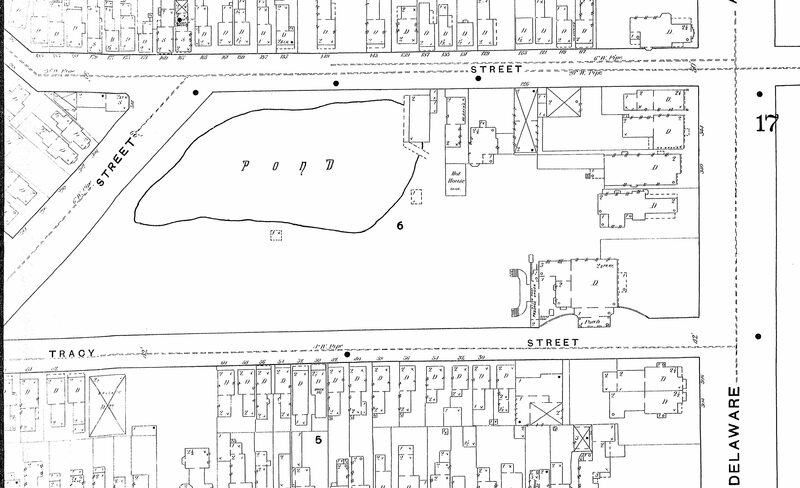 Bronson’s children also lived at Rumsey Park: Mary Lovering Rumsey and her husband Edward Movius lived at 334 Delaware Avenue, Evelyn Rumsey married Charles Cary and lived at 340 Delaware Avenue, and Bronson II lived at 132 West Tupper Street. 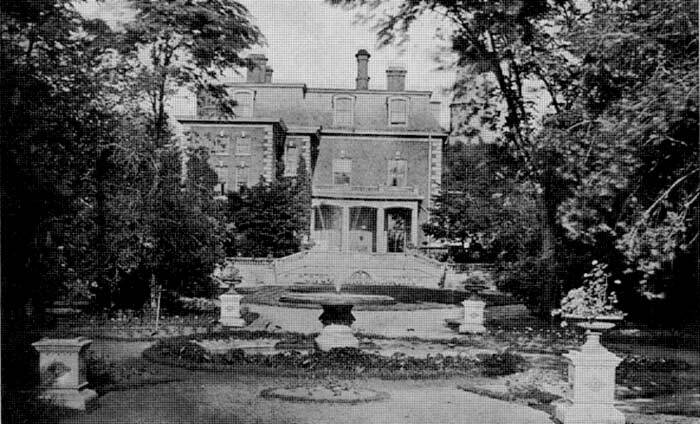 The eldest son, Laurence, lived at 1 Park Place, in the house the family had lived in prior to construction of Rumsey Park. 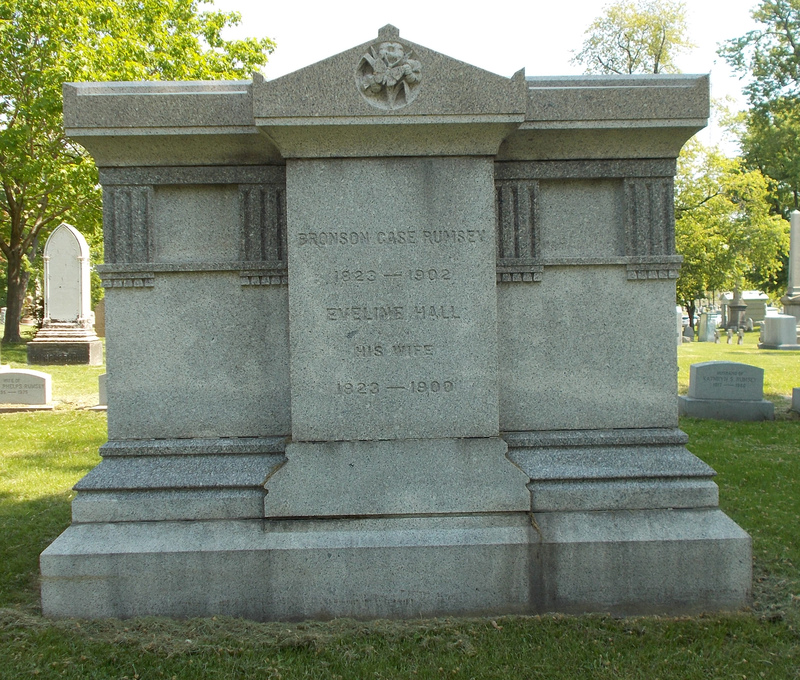 Bronson Rumsey died in 1902 and is buried in the Rumsey Family plot in Forest Lawn Cemetery.The expansion of Elmwood Avenue south to connect with Morgan Street, cut through the center of Rumsey Park. The lake was filled in and the property was subdivided. Development of the property into lots began around 1912, as the Rumsey family sold the off the properties. The second Rumsey son, Dexter Phelps Rumsey, was born in Westfield, Chautauqua County on April 27, 1827. Dexter donated greatly to charities, particularly those committed to children, his favorite charity was the Fresh Air Mission. 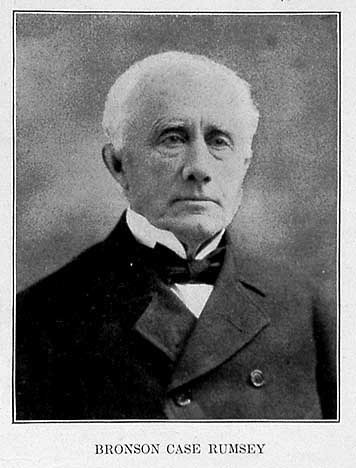 Dexter served as Director of Erie County Savings Bank and was President of the Buffalo Club. He was also an original trustee of the Buffalo City Cemetery, which established and operates Forest Lawn Cemetery. Dexter was married three times: first to Mary Coburn who died in 1859, to Mary Bissell who died in 1886 and to Susan Fiske. Dexter had four children. Cornelia married Ainsley Wilcox, who passed away two years later. Mary Grace then married Ainsley Wilcox in 1883. The Wilcox Mansion (now known as the Theodore Roosevelt Inaugural Site) was a wedding gift from Dexter to Mary Grace and Ainsley. Ruth married William “Wild Bill” Donovan. Dexter P. Rumsey, Jr was friends with F. Scott Fitzgerald during his time in Buffalo. F. Scott Fitzgerald’s writings referred to Dexter as among his “fascinating army” of childhood friends. 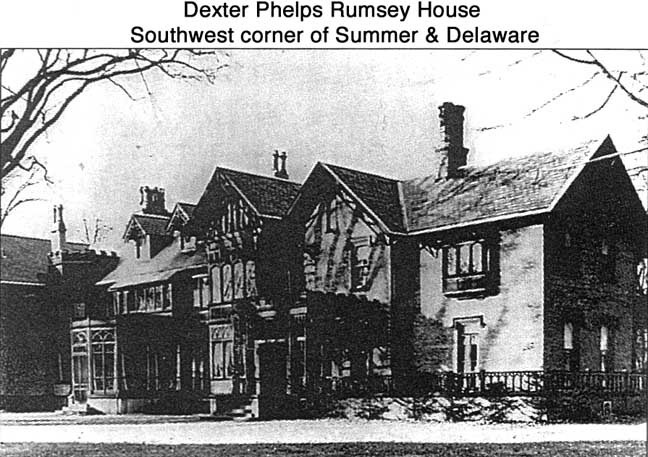 Dexter and his family lived at 742 Delaware Avenue, at the southwest corner of Delaware and Summer Street. The house was owned by the Rumsey family from 1857 until 1945. The house was one of the oldest in the City, first portions of it were erected in the 1830s. The house was still located in the countryside when Dexter moved in and he kept cows on the property through the 1860s. Mr. Rumsey is said that to have bought the house where he did because he was confident of Buffalo’s northward expansion. Dexter’s stables remain near the grounds of his old Delaware Ave mansion, and are used by Westminster Presbyterian Church. Dexter’s confidence in Buffalo’s growth was also said to be why he purchased the large tracts of woodland in the vicinity north of today’s Delaware Park, sometimes referred to as the Rumsey Farm. A portion (approximately 350 acres) of Rumsey Farm in North Buffalo was used for the Pan American Exposition in 1901. The land was flat, treeless and landlocked. A great deal of deliberation was made in regards to if the site represented enough of Buffalo, without a waterfront or hills. The site had the benefit of being undeveloped and the lack of hills made it easy to build upon, therefore the site was selected. The lack of trees was made up for by connecting the exposition grounds to Delaware Park. After the Exposition, the leased lands were returned to their original state and the properties were subdivided for residential development. Many members of the Rumsey family and their in-laws were involved in the Pan-American Exposition. Bronson’s grandson Charles Cary Rumsey was an artist who created several of the sculptures for the exposition. The Centaur in front of the Buffalo History Museum is an example of one of Charles’ sculptures. Charles’ uncle George Cary was the architect who designed the Buffalo History Museum. 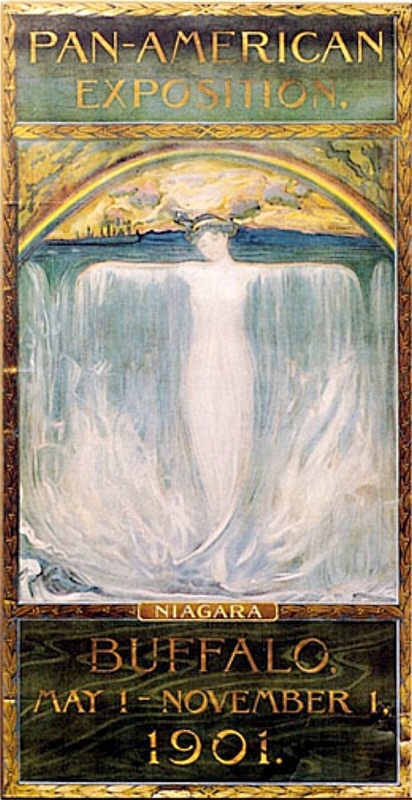 Bronson’s daughter Evelyn created the Spirit of Niagara painting that was used for much of the Pan American advertising (one of my all-time favorite paintings!) Most infamously, Dexter’s daughter and son-in-law Mary Grace and Ainsley Wilcox, were the owners of the house where Teddy Roosevelt was inaugurated following President McKinley’s death. Dexter died on April 5, 1906 and is buried in the Rumsey family plot in Forest Lawn Cemetery. When Dexter passed away, his wife and daughter Grace donated to the City Park Department the block of land adjacent to Delaware Park to add to the grove of trees to the park. The grounds are still known as Rumsey Woods to this day. Bronson and Dexter’s sister, Eleanor, married William Crocker. Eleanor had two children, William and Nellie. She passed away in 1863 at the age of 36. After Eleanor’s death, the Crockers relocated from Buffalo to Pennsylvania. 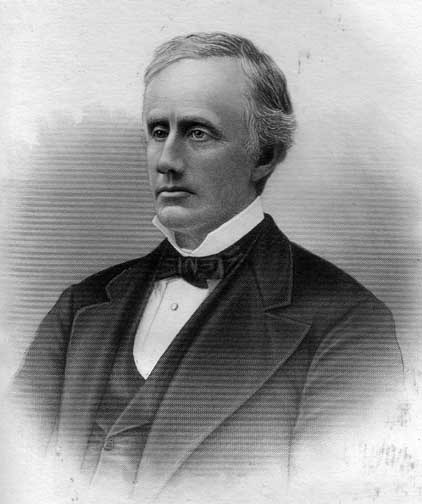 William Junior became a prominent lawyer in Williamsport, Pennsylvania. Want to learn about other streets? Check out the Street Index. Larned, J.N.A History of Buffalo: Delineating the Evolution of the City. Published by Progress of the Empire State Company. New York, 1911.